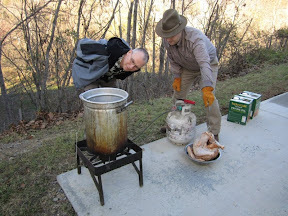 Another Thanksgiving has come... and with it, once again, another round of Yours Truly doin' up some deep-fried turkey! This year's Thanksgiving was special, in a number of ways. For one, I'm spending it with Kristen and her family. 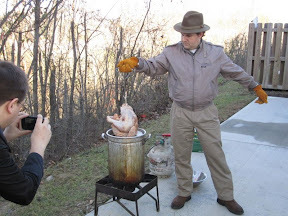 For another, this marks my tenth anniversary of deep-frying turkey! So for those reasons and more, I wanted this one to be extra special. 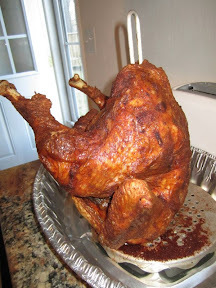 Here's the turkey chosen to be sacrificed to the flames and the oil. I found one weighing-in at just under 15 pounds: the perfect mass to feed a gang of six! What you see here is the turkey on the spit ready to be fried, after spending thirty-three hours of being marinaded and rubbed down with Cajun seasoning. Awright, this next picture requires some explanation. The oil was in the pot and I had just turned on the burner when I realized to much horror... my thermometer was broken!!! The trusty instrument that had seen ten years and many, many fried turkeys had died. And at the WORST possible moment too! No time to panic though. Not as one working with hazardous materials. Certainly not as an Eagle Scout. Kristen's mom and brother made a quick jaunt to Wal-Mart and found two thermometers, neither one of them built with deep-frying safety in mind but hey, ya gotta takes what ya can. 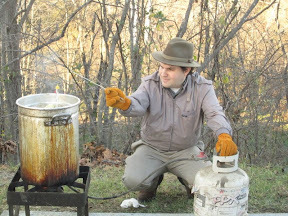 So here is me in what Kristen calls the "fisherman pose": lowering a candy thermometer into the oil with a wire coat hanger! ...the culinary masterpiece was ready to be admired for its beauty and its juicy, delicious flavor! 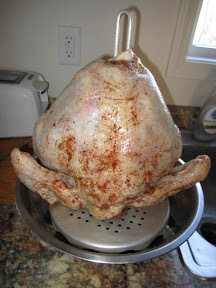 I'm always looking for new ways to improve my turkey-frying technique. There were a couple of tricks that I employed this time for both product quality and personal safety. With the exception of the thermometer emergency, the entire process was by far the smoothest and cleanest that I've ever had. 'Twas a most excellent Thanksgiving dinner! The turkey came out great, and there was the terrific desserts made by Kristen's mom and sister-in-law (Melissa makes the most potent chocolate cupcakes in the history of anything). So in celebration of the imminent return we shall be making to that galaxy far, far away, I had Disc 2 of The Empire Strikes Back: Special Edtion playing from my iPod. 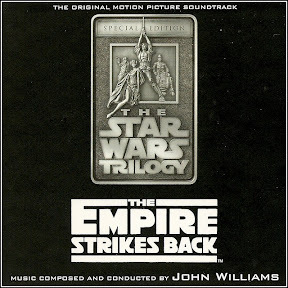 Not just John Williams' finest composition for a Star Wars movie, but in my opinion the definitive Star Wars orchestral score album!